Few travel bargains trump admission to a national park, where the daily cost frequently comes in well below $20 per person. In fact, that amount often pays for an entire carload of visitors. 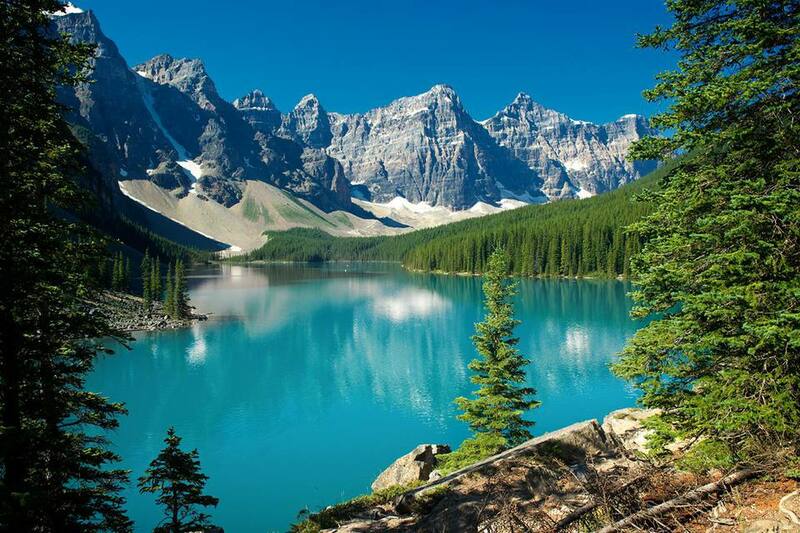 The beauty in this photograph lies within Canada's Banff National Park, at the Valley of the 10 Peaks and Moraine Lake. In the United States, $20 buys a lifetime national park senior pass for citizens and permanent residents at least 62 years old. For others, the annual pass costs $80, which isn't a bad deal. Remember that most national parks charge extra fees for campsites, tours and some special programs. Whether you're in the U.S., Canada, Costa Rica or some other nation known for national parks, it's likely you'll find the admission fees among the best travel bargains for under $20. Many on a tight budget don't see guided walking tours as travel bargains, and it's also true that some walking tours might cost more than our $20 limit. But there are many times when it is penny-wise and pound-foolish to economize on these costs. If you've invested big money in getting to a destination, why not wring out the best value from that expenditure? An extra $10/person to understand the historic district of a world city bolsters the $1,000 airfare investment you made to get there. The tour cost can be kept lower by steering clear of the big commercial operations and seeking out advice from locals or from experienced travelers who know your destination. Keep in mind that the guides sometimes earn most of their pay on gratuities, and that admissions to the places they show are sometimes not included. Also remember that free guided walking tours are available in many places. You'll be asked to tip in accordance with the quality of the presentation. If you've done your homework preparing for the trip, the amount invested in a guided walking tour becomes a small price to pay for added enjoyment and understanding. If the weather cooperates, renting a bike in Vienna can rank among your most enjoyable travel bargains. The city's spacious, scenic parks and world-famous architecture make a leisurely ride memorable. A service called City Bike provides self-service rental stations at 116 locations in Vienna and offers about 1,400 bikes. You'll need to pay a €1 registration fee, but this can be done online with a credit card. The first hour of your ride is free. The second hour only costs €1. So it's possible to spend two hours peddling through one of the world's most beautiful cities for less than what many people pay for a cup of coffee. As you might imagine, it's a popular option. City Bike's CEO claims that nearly 800,000 people rented bikes from the company in a recent year, and that they covered about 2.5 million kilometers. Not all destinations offer such a service. But it usually pays to do a web search for bike rentals to see if this economical approach to spending an afternoon can add value to your trip. If you're trying to see Athens, you'll find a clean, efficient subway system among the potential travel bargains. A daily ticket for the Athens Metro entitles you to bus, tramway and suburban railway rides for €4 ($5.50 USD). If you're headed to Baltimore, it's possible to land at BWI, board the Maryland Transit Administration's light rail train, and wind up at Camden Yards or the convention center for less than $2. A day pass, good for travel not only on the trains but also other forms of mass transit, costs only $3.50. There is only one line, but if you can find a hotel within walking distance of a stop (or a connected bus stop), you could avoid the cost of a car rental and downtown parking. These two examples, thousands of miles apart, illustrate how a daily transit pass can benefit your travel budget. Even without a pass, there are at least a dozen North American cities where you can catch an airport train into the city for less than $10. In other cities, a day pass will cost quite a bit more, but provide outstanding value. In London, for example, a daily Tube pass permitting unlimited travel within one-zone on one of the world's most extensive mass transit systems is £12.10 ($18 USD). Ground transportation can become expensive, especially when using cabs. You'll be paying the meter rate and a gratuity. Finding a day pass for your destination city allows you to pay for much of your transportation with one purchase and then concentrate on more enjoyable expenditures. Few buys are less glamorous than feeding money into a luggage locker, or handing over some cash to a left luggage attendant. But such liberation from luggage ranks with the best travel bargains. Let's say you haven't selected a place to stay. A centrally located storage facility, such as the one pictured here at Munich's Ostbahnhof, will make you a far more nimble negotiator should the room rates start a bit too high. People burdened with luggage don't make quick exits. Sometimes, an extended layover can afford several hours of sightseeing in a place where you won't be renting a room. Storing your luggage will enhance your enjoyment and therefore the value of your trip. Costs for a storage rental vary greatly. Train station lockers (where you can still find them) are generally less than $10 USD for a day. Left luggage counters (which have become more common in wake of terrorist attacks) involve a security check and generally bigger storage tabs. Often, it is good practice to pay the fees, even if they are greater than expected. The alternative will punish your muscles and nerves. If Shopping Duty Free, What Should You Buy?